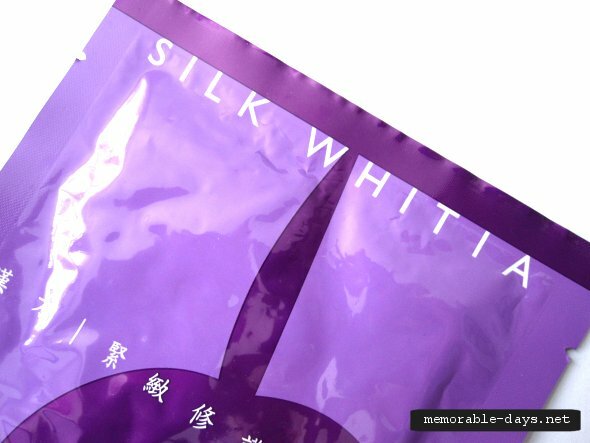 Review: Silk Whitia - Hanfang firming mask | Memorable Days : Beauty Blog - Korean Beauty, European, American Product Reviews. The rich content of natural citric Acid and Malic Acid extracted from Fructus Schisandrae Essence effectively refine pores. Ginseng Extract, Vitamin E and collagen soothe fine lines, revitalize the skin and postpone aging, restoring the skin to become fine, firm, supple and radiant. Sasa is selling it for $16.60 per box. 1 box comes with 5 masks which means that 1 mask costs $3.32, that's quite expensive for masks though. However, Sasa often have a buy 1 get 1 free deal which means that you will get 10 masks for $1.66 per mask. It's out of stock at Sasa at the moment, so you won't be able to buy it now. The packaging is purple with a cherry? on it. It looks very simple and neat. Like all the other masks, you have to tear the packaging open to get the mask out. These masks are more thick and softer compared to the My Beauty diary masks (natural line). The mask came folded and it was drenched in essence. There was lots of serum on it, the essence was even dripping so I recommend to put a tissue under it while unfolding the mask. The serum was also sticky >.<' that's the reason why you have to wash it after after 20 minutes. This mask didn't have a scent and the fitting was good for my face. These pictures were taken after I left it on my face for 20 minutes. 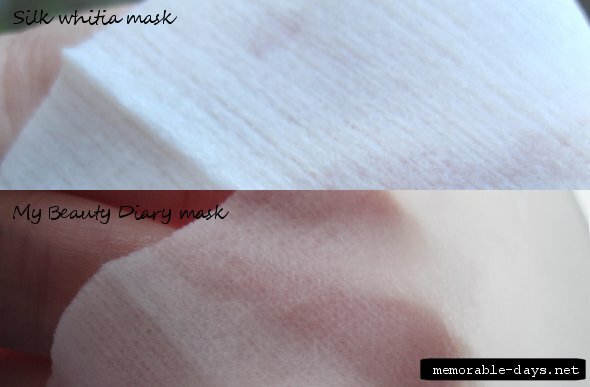 As you can see, the Silk Whitia mask is thicker than the My Beauty Diary mask. Fructus Schisandrae Essence, Wheat Germ Protein, Ginseng Extract, Vitamin E, Betaine, Propylene Glycol. On the packaging it says that the material is from France and the Plants Essence is from Hong Kong. Place the firming mask onto cleansed skin and leave it on face for 15 - 20 minutes, then remove and rinse face with water. Use daily for best results. I wanted to try this mask since Fuzkittie highly recommended this mask. Lol watching Youtube videos ain't good, it makes me want to buy a lot of products hahah. Anyways, back to my opinion of this product. This is the first mask that I've tried of this brand, so I was excited to try it out. This mask doesn't have many ingredients which can be a good thing. It's quite expensive though. I would buy it if Sasa has a great deal again, but I wouldn't buy this mask for the normal price ($16.60 per box). My experience with this mask is good. After I pulled the mask off after 20 minutes, my face felt stiff, i guess that's the firming effect ^_^. After washing my face, it felt moisturized and firm. I loved the result, this mask really worked after using it only once. If you want to purchase Silk Whitia masks, I definitely would recommend this one.